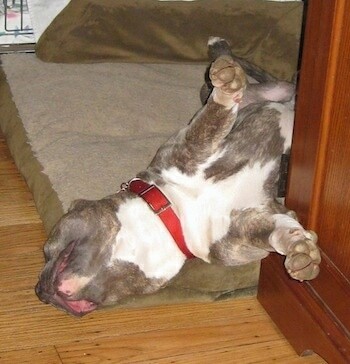 A day in the life with Spencer the American Pit Bull Terrier puppy. Spencer's 27th week—36 weeks old, 76 pounds, 22 3/8 inches from the ground to the highest point of the shoulders (the withers). Spencer often sleeps a very odd way. 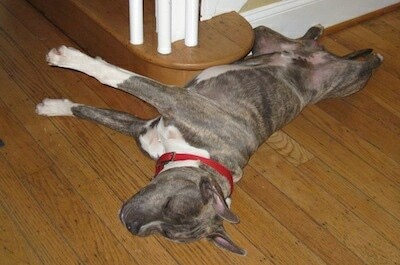 He lies on his back and stretches his front paws in a stiff lock position, back legs spread. He will sleep like that for long periods of time. Fast asleep, yet stiff as a board. I had taken Spencer for an off-leash walk in the woods. When we reached the pond area he perked up and moved into the long grass. Then I heard something else moving quickly in the grass ahead of him. I was thinking, oh great a cat. I waited before I told him to leave it. I wanted to see exactly what it was first and good thing I waited. It was the fox! Not too far from that fox were all of our chickens and peafowl who were free ranging. Spencer chased the fox out of the tall grass, away from the birds, right past me and into the woods. Good boy, Spence! You may have just saved a bird today. I am going to work on teaching him the command "fox" so he knows to hunt around for the smell on command just like Allie the Boxer used to do. I was outside with Spencer. The kids had just gotten home from school and the pup spotted them. He darted toward the house at top speed! The kids were home! They had gone inside the house before he made it to the front door. I walked over and let him in. Spence started looking for them. 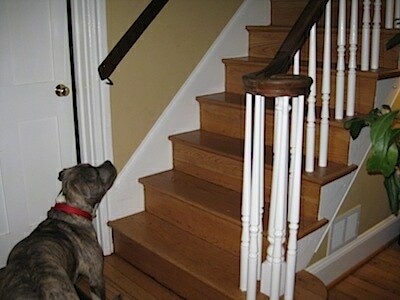 He looked up the stairs. He's not allowed up the steps so he just looked and listened. Then he heard Sara's voice and he peered around the corner listening. Not sure, he looked back up the steps. But then he heard it again, Sara's voice. It was coming from the kitchen. He took off running. He stopped in the kitchen and looked. He didn't see her. He listened. He heard her again in the powder room off of the kitchen and he ran toward it. When he finally spotted her, he came to a stop about four feet from her and calmly stood there looking at her. Then Amie walked up from the other direction and once again he went to her but gave about two feet of space and he stayed calm. He waited for them to initiate play with him. It really occurred to me what good pack leaders the kids are to that pup. Spencer didn't rush them, didn't jump on them, was not hyper when he saw them, yet he was very happy they were home. Those are the manners a balanced dog gives to a respected pack leader. The kids play with him all of the time, but they also make sure they start the play and end the play on their terms. They teach him tricks. They sit with him and rub his belly and he totally relaxes. 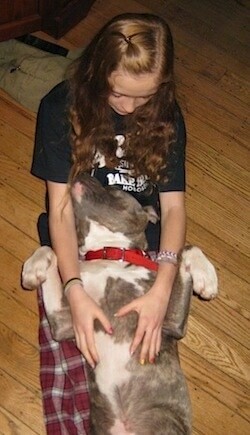 They give him lots of love, but they never give him any type of affection unless he is calm and acting submissive. If the pup gets too rough they correct him and never let him get out of control. 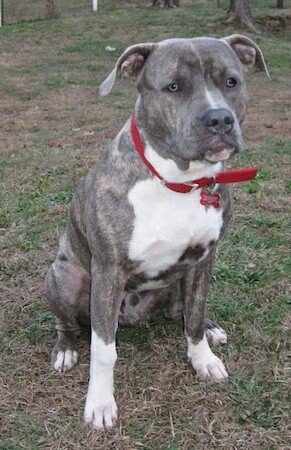 They go in and out doors before the pup and always make him heel on a leash. In return they get a dog that never jumps on them, listens to all of their commands and that loves to play with them. Dogs that rush up, jump on or crowd their owners are not showing the type of respect that dogs give to higher members of the pack. When a dog (large or small) jumps up on a human it is telling the human it is "the one"; that check of power. Small dogs are notorious for this type of power checking. They jump up and touch the person with their front paws to let them know just who's in charge. It's such a light touch that humans tend to find it cute but the humans are thinking human, not the meaning it has to the dog. As we put the Christmas tree up, Spencer came over to investigate. I immediately told him "back" and sent him away. Spencer went and lay down in his bed. 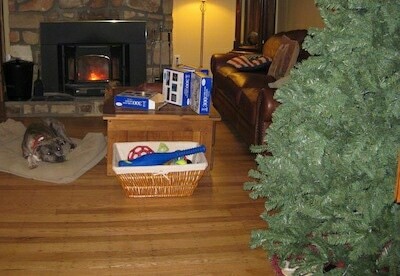 The tree is where his dog bed usually is so he is curious about all of the changes going on. It is OK for him to be curious, but he has to be curious at a distance. I need to tell him that is not his tree and the things going onto the tree are not his. He must back off and leave them alone. He has a very good nose; he does not need to be right up under the tree or touching it in order to smell it. He had tried to come over and investigate a few times but each time I sent him back. I am hoping that was enough to communicate that the tree is not a chew toy of his and is off limits to him. The real test will be when all of the ornaments are on. Spencer-Puppy, now I know that the wood and your bone are about the same color, but clearly you have to know they are not the same thing. You're not lucky enough to have a pile of bones outside the front door ready and waiting for you. You're going to get a splinter in your tongue! Spencer, make yourself useful and bring them inside to the fireplace. Spencer will pick up a log and carry it around the yard. 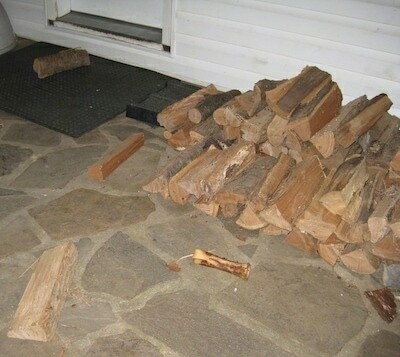 See the log in front of the door step? I almost stepped on that coming outside. No one is surprised anymore when they find logs lying all over. People laugh at him because he looks so funny carrying a big log in his mouth. Because he is laughed at its like saying "Good Boy" so he keeps doing it.